Inspired by the Christmas decorating ideas I posted earlier this week, I got to work on making some of my own holiday decor. My first project was this simple star wall hanging. In the process, I also discovered how easy it is to turn my LED lights into garlands. With wire LED lights you don’t even need additional wire, you can just wind the wire of the lights around evergreen branches. With branches I foraged from my neighborhood, I had an evergreen garland in no time. Which also worked perfectly coiled into a jar, for a magical, twinkly effect. I really like the simplicity of this style of decoration, and it’s super easy to make. You could even speed the process up by using oven-bake clay rather than air-dry clay, and have this done in an afternoon. Put on some holiday records, and stay cozy while you get crafty. Sounds like a perfect winter evening to me. Air-dry clay – I used this kind. Fishing line or clear sewing thread – I used some like this. 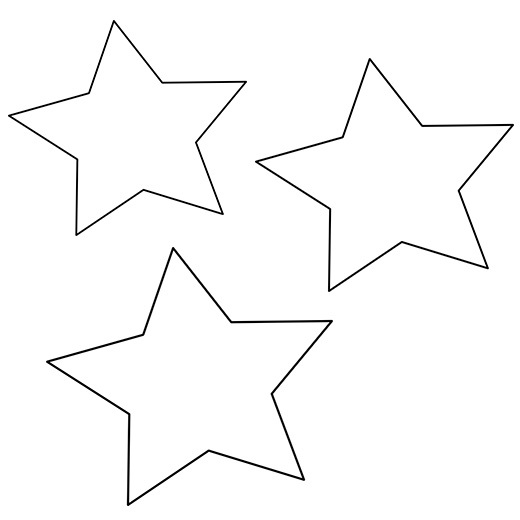 Stars template, or small star cookie cutter (1-2 inches) – I used three different star sizes that I created with this template. 1. On a layer of wax paper, roll clay 1/8″ to 1/4″ thick. Keep in mind that the thinner the clay, the more delicate the stars will be, but the thicker the clay, the longer it will take to dry. Cut out the star templates, lay them on the clay, printed side up (my printer ink slightly transferred when I placed them ink-side-down), then cut around the stars with a knife. Remove excess clay. Repeat until you’ve cut out at least 20 stars. Do a few more than you expect to need, just in case any break. 2. Carefully remove the clay stars from the wax paper, and poke a hole for hanging with a toothpick. Pick the star up to make sure the hole goes all the way through on both sides. Although I poked mine pretty close to the point of the star in this instance, I had the point break off in one case, so poke the holes closer to the center, more like the ones you see in the next step. 3. Set the stars aside to dry on a piece of wax paper. Drying time will be at least 24 hours, but it will depend on the humidity and temperature in your house. The clay will lighten in color as it dries. 4. After the stars have dried, tie lengths of thread or string to them. I used invisible thread, which lives up to its name, because you can just barely see it here. I used a starting thread length of 12″ to 15″, but your length may vary. 5. Tie a piece of yarn or twine to either end of the branch to hang it up, then tie the stars to it at varying heights. Adjust the thread lengths, and trim excess thread. Hang up your new decoration, and enjoy the holidays!